Jennifer The biggest and most Swedish celebration of the year is Midsommarafton, or the day before the shortest evening of the year. This day should technically coincide with the solstice, of course, but some time ago it was decided that Midsommardag (observed) would always fall on the Saturday closest to the solstice, and so Midsommarafton falls the Friday before that. In 2008, these dates just happened to not just technically, but actually coincide. You are supposed to have your big parties on Midsoammarafton, so in practice, the Thursday before is often taken as a vacation day, and even people who don't take the day off tend to leave a little early. Therefore attendance at Thursday afternoon's fika was a little sparse, consisting mostly of foreigners. Last week, I had proposed to my advisor a meeting on the next Friday afternoon as usual; she looked at me with something like incomprehension. "But it's Midsommarafton," she said in a kindly voice, after a few moments of stunned silence. Someone else later confirmed that what I had done was analogous to proposing a meeting at 9am Christmas morning. So Midsommar is a big deal, and we decided to celebrate with fellow foreigners G. and D. (the friends who took us out to their stuga last weekend). On Friday, though, everyone was tired or sick, so we decided to celebrate on Saturday instead. 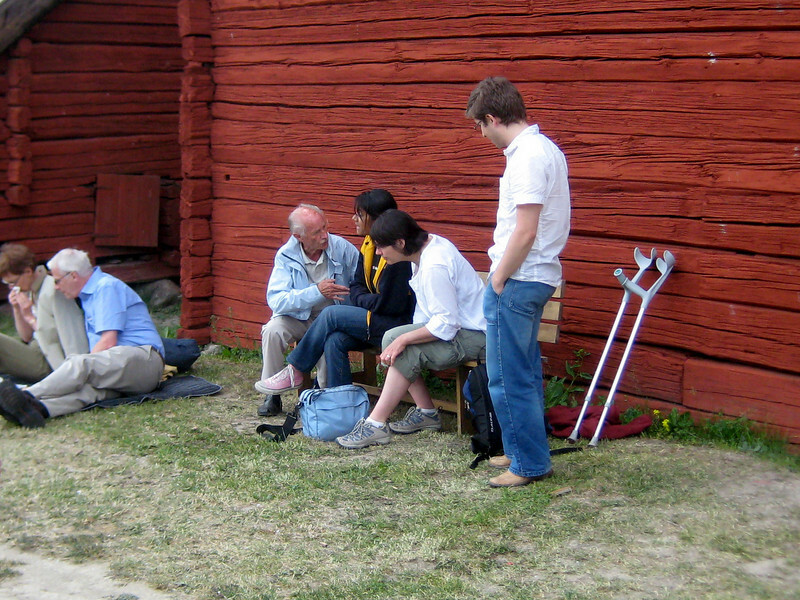 Gamla Uppsala has an outdoor museum called Disagården that consists of old farm buildings, and is meant to more-or-less replicate a medieval Swedish village. 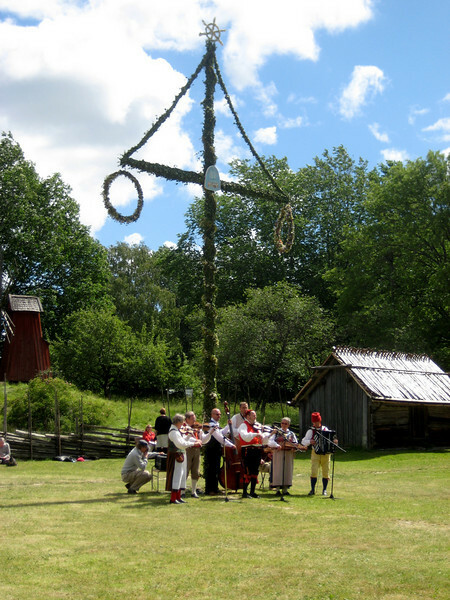 So for Midsommar, they erect a maypole and have dancing and traditional music and so forth. I suspect this is done mostly because Uppsala has such a large population of foreigners and people like hospital workers who cannot for some reason leave town this weekend; all other Swedes have left the city for whatever countryside they can get to, to celebrate with their families and friends, and I have never yet seen the city so deserted as it was yesterday. All the bus drivers on duty were obviously recent-ish immigrants, probably getting triple-time pay for working on this holiday. Everybody who was left in town was obviously an "other" of some type. And of course, that includes us. So back we went to G. and D.'s flat, not too far from Gamla Uppsala, and had a cold beer which was very welcome after the warm sun and all that culture. We had decided to do as close to a real Swedish midsummer feast as possible, so the beer before dinner was a good start, then we had pre-dinner elderflower cocktails (perhaps not strictly traditional but yummy and refreshing), then dinner: knäckebrod, gravad lax, potatis med dill (both cold and hot, we brought the creamy dill potato salad), kräftorsalad, and three kinds of sill: sill i senapsås, sill i midsommarsås, och sill in vitlöksås. We had also brought a bottle of O.P. 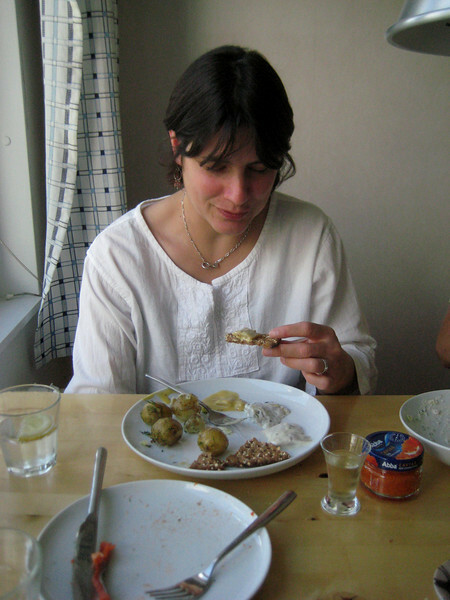 Andersen, a traditional aquavit, with which you are supposed to wash down the herring. And we did use it for that. And it helped. (Actually the herring, which I had been dreading, wasn't really all that bad. At least not when you've already got potatoes and several forms of alcohol in you... and everything else was delicious). After dinner we played cards for a while, with another cocktail. We decided that a complicated game like chibre was a bit too taxing for our current mental states, so we played hearts instead, which I haven't played in years and was lots of fun. Then Joe and I made dessert, strawberry shortcake (apparently anything with strawberries is fair game for Midsommar dessert), with which we had Italian brewed coffee and cream. We sat and chatted for a while after that, and looked at some pictures of their respective homes and travels in Switzerland (good heavens, what a gorgeous country). We took our leave at about 9pm, with the sun still strong in the sky, and arrived home in time for the sunset pictures from yesterday's post. Even though we were exhausted and stuffed full, we still didn't manage to fall asleep before midnight because it was so light out, and so pretty. And fortunately of course we had today, Sunday, to recover from it all. A very successful celebration, I think, and a hearty Glad Midsommar to all of you reading this! Thanks for the midsummer info. I knew it was big--but I didn't know it was that big. Coincidently, I had strawberry shortcake for dinner on Friday--with leftovers for breakfast on Saturday. mmm. And in more things Swedish, Uppsala was a clue in the NYT crossword on Saturday or Friday.